REVIEW AND GIVEAWAY - Chicken Soup For the Soul: True Love - Mom Knows It All. Everyone loves a good love story. And we all love stories about how the love started and blossomed. This fun new book about dating, romance, love, and marriage, will make readers laugh and cry, and is guaranteed to inspire a renewed search for that special someone or open the heart a little more to the love already found. Stories of how couples met, when “they knew,” good and bad dates, proposals, maintaining the relationship, second chances, and all the other ups and downs of love, romance, and marriage will entertain, encourage, and warm the hearts of all readers. A great Valentine’s, wedding, or romantic gift! I like the Chicken Soup For The Soul books for lots of reasons. They’re diverse, light, touching, easy to read and they often cause one to reminisce. This is especially the case with Chicken Soup For The Soul: True Love – a book about love in it’s many phases including dating, marriage and death. This is my favorite Chicken Soup book to date. The book contained a forward from skater Kristi Yamaguchi and her husband on how they met and eventually married. Reading about how he proposed and what he was thinking made me chuckle. This book is broken into chapters titled How We Met; Adventures in Dating; Meant to Be; The Proposal; The Wedding; Keeping the Love Alive; Lessons in True Love; Happily Ever After; Gifts from the Heart; and Love Everlasting. My favorite story of all was Special Friends Special Love, it had me balling my eyes out. Lighter favorites included My Ninja and The Counterproposal. The Last Valentine and The Most Glorious Vacation brought a tear to my eye. This book is a great fit for anybody and would also make a great gift. 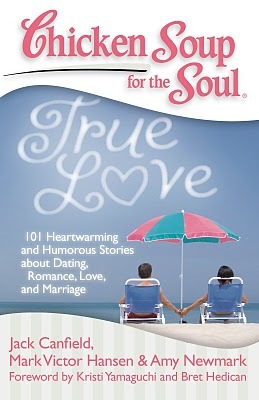 ONE winner will receive a copy of the book Chicken Soup For The Soul: True Love. To enter leave a comment on this post telling me how you feel about true love. US addresses only please, no PO Boxes. This contest will end on Sunday 07/18/10 at 11:59 pm est. If you’ve entered any of my giveaways before then you know that only comments containing all of the requested information will be eligible for entry. The winner must contact me to confirm they wish to receive the prize within two days of my email notifying them they’ve won. Good luck to everyone! True love is my husband! I met my true love when I was only 21 and we’re still going strong 22 years later! I think growing up having the parents I have taught me a lot about true love. They are still together after 47 years and they are amazing!! Love has so many faces. If it is true love, it lasts. True love is hard to find and sometimes very fleeting. True love is a lot of work, but the benefits are well worth it. I honestly believe in true love! There is someone for everyone, and you can feel it to your soul when you’ve met your one true love!